There's a reason why we call this the Mega Bounce. 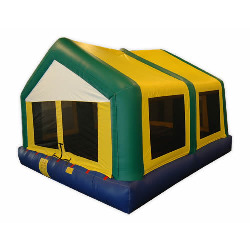 This bounce is so big that it looks like it ate two other bounce houses for lunch. We can't prove it, but we think it did. It is a must have for any large event. We can fit twice as many kids in it, and there's still tons of room for them to bounce around! Until you see it, you don't understand what we mean when we say 'Mega' Bounce.